Amid the heightened trade tensions between Canada and the US, Canadian officials say they want to continue the process of renegotiating NAFTA beyond the initially-coordinated seven rounds of talks. 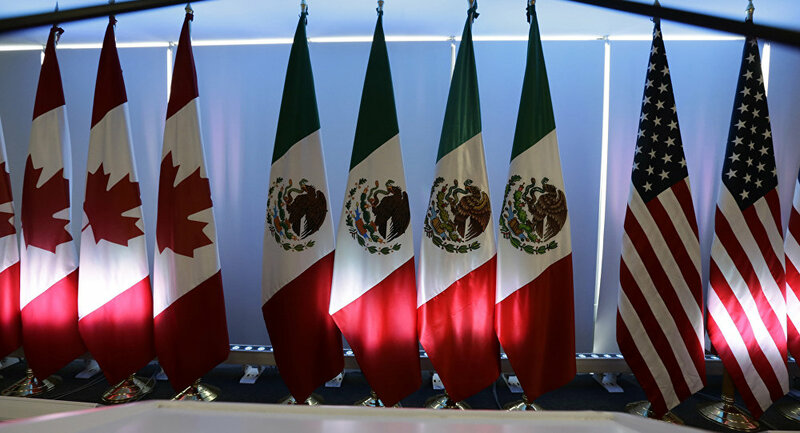 Kristian Rouz — The negotiations to amend and modernize NAFTA — a trade pact concluded between Canada, Mexico, and the US back in 1994 — have faltered without yielding any major breakthroughs throughout past several months. However, Canadian representatives suggest the talks should move to another round, whilst the Trump administration is increasingly leaning toward abandoning what it sees as an unfair trade agreement. Canada's chief negotiator Steve Verheul says trade representatives and diplomats from the three countries are trying to reach mutual understanding on key issues, and have achieved some progress. "We're moving in a slightly more positive direction. We'll take that encouragement where we can," Verheul said, adding he hopes political leaders in the three member-countries decide the talks should continue. This comes after the US slapped prohibitively high customs tariffs on Canadian softwood lumber, resulting in a dramatic drop in Canadian southbound lumber exports. Additionally, a merger and acquisition dispute between Boeing and Airbus over the Canadian regional jet-maker Bombardier — resolved in favor of Airbus — didn't contribute to easing US-Canadian trade tensions. President Trump said NAFTA — a $1.2-trillion agreement — is a "disaster," as both Canadian and Mexican manufacturers have enjoyed unlimited access to the US market for over two decades, contributing the gaping US trade deficit. The current, sixth, round of NAFTA renegotiations is slated to end Monday. Officials had previously agreed there would be seven rounds of talks — but Canada hopes the negotiations could be extended. "I think we've demonstrated we have engaged on most of the big issues," Verheul said. "We've made progress on some of the smaller ones, so, I think, not a bad week." The Canadian economy has been gradually improving since 2016, coinciding with an acceleration in US manufacturing, construction, and consumer demand. Restrictions on Canada's access to the US market are expected to hinder economic growth prospects in the country — a development Ottawa is hoping to avoid. Canadian officials have tried to fight the Trump administration's protectionist decisions, including in the World Trade Organization (WTO) — to little avail, but bilateral relations appear to have soured over the recent trade disputes. "The atmosphere doesn't look too good on the US-Canada trade front," says John Weekes, a Canadian official back in the 1990s who helped forge the original NAFTA agreement. "We've never been in a situation like this before with a [US] president who is so unpredictable." US representatives have repeatedly rebuked the accusations of President Trump's alleged unpredictability, saying they are coherently pursuing the goal of defending US private sector enterprises — mainly, in the manufacturing sector — from dumping and other unfair trade practices. "I may terminate NAFTA, I may not," President Trump said at the World Economic Forum in Davos, Switzerland. "We have a good chance" to update the pact, the President added. The US is seeking to reach an agreement on bringing factory input costs in Canada and Mexico in line with those in the US, so factory-gate prices on manufactured goods don't differ quite as much. Alternatively, the US may also seek to impose tariffs and regulatory limitations of imports from Canada and Mexico, in order to make the prices of goods produced in either of the two and the US, roughly equal. In addition, Washington is seeking quotas, requiring more automobiles produced in the US, seasonal caps on agricultural labour — which echoes a separate major issue, the looming immigration reform in the US, — new trade dispute resolution procedures, and a provision NAFTA must be extended every five years, requiring explicit agreement of each of its member-countries. The fate of the NAFTA talks could be decided Monday when US Trade Representative Robert Lighthizer is set to meet with the Mexican Economy Minister Ildefonso Guajardo, and the Canadian Foreign Minister Chrystia Freeland. "It's going to be a fun and I hope really useful and productive discussion," Freeland said about the upcoming meeting. "We're prepared for every different possible outcome." This comes as some Canadian officials warn they want free trade with the US, but "not at any cost" — sparking allegations of Canada's "obstructionism" on the part of US negotiators.